We provide honest and professional guitar repair and custom modifications for electric, acoustic, bass guitars and other stringed instruments. With over thirty-five years of experience, our quality is unparalleled, and our work proves it. We provide services as simple as a string change to minor and major setups, neck adjustments, fret work, peghead, bridge and crack repair; saddle, nut, and pickup installation, just to name a few. George can discuss the cost and options with you at the time of your request. Please feel free to ask George any questions regarding your instrument. We use a neck jig to insure the most accurate fretwork during refreting and fret leveling procedures. 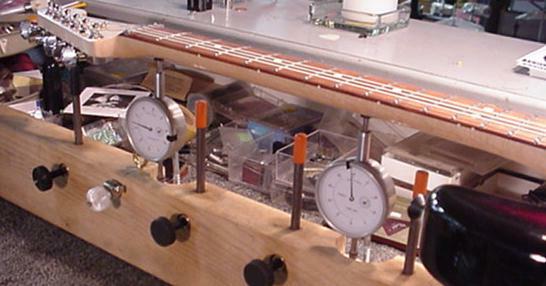 This jig allows us to simulate string tension and truss rod tension with the strings off. This guitar only needs to have some frets seated and secured. Fret ends lifted due to extremely dry wood. Proper care can prevents this. This guitar has seen a lot of playing time by it’s owner. Most of the wear is on the treble side, up to the fifth fret. The rest of the neck shows wear but not to this extent. With the strings removed you can see the extreme fret board wear from the players fingernails. Keeping your nails trimmed can minimize this problem. As frets are removed small chips of wood are lifted from the slots edge. These need to be secured. Some woods chip more than others. Here the chips are being secured with a bead of water thin C.A. glue run on each side of the slot. At this point in the job the neck starts to look pretty ugly. The neck is sanded with a radius block that matches the necks original radius. This removes the excess C.A. and restores the fret board surface. Fret slots are cleaned. Each fret is seated by hand with a handheld press. This technique allows us to control the precise fit of the fret tang into each slot. You can feel it seat. By under cutting the tang we are fretting inside the binding and allowing the fret wire to overhang the binding. This allows a slightly wider playing surface. Next the ends are cut flush and then beveled to the proper angle. When we see binding shavings we know we are flush with the edge. The fret ends are carefully dressed to remove any sharp edges. The frets are then checked with a level to insure all frets are the same height. Because we perform all these steps in the neck jig simulating string tension, truss rod tension and the guitar in the playing position, we insure the highest level of accuracy in our fretwork. Frets are finally polished to a mirror shine, removing all tool marks. The dark spots on each side of the frets is polishing compound and will be removed with naphtha. This guitar is ready to be restrung and rock for years to come. This instruments owner thought it was a total loss. You can see the large hole in the side as well as the top broken free from the side and a large crack in the top that extended to the bridge. You can also see the crack in the side extending from the hole toward the neck. These instruments are constructed from extremely light thin solid woods. Luckily the owner tried to collect as many pieces of the instrument as posable. This made all the difference in attaining a clean repair as you’ll see. First, the long split in the side is secured to stabilize and help align the rest of the body. This helps to insure the body will take the broken pieces properly. The top is clamped to align the split and to secure it to the lower bout. Both the split and the top are then glued with the top secured to the tail block. After the split in the top is repaired the top is then aligned to the side and clamped and glued. An internal brace is also glued into place to allow alignment and clamping of the loose pieces. More bracing and pieces are fit into place slowly closing the hole. Amazingly almost 98 % of the pieces were recovered at the time of the break. It’s a lot like working a jigsaw puzzle that’s all one color. This is the final repair before a light coat of nitrocellulose lacquer. As you can see the repair is invisible to a casual glance. Even close inspection can hardly reveal the gaping hole that was there, the damage done to the top as well as the large crack in the side. This repair would not have been posable if it weren’t for the owner collecting all the pieces he could find at the time of the accident. We won’t go into how this actually happened, but suffice it to say he and his wife are extremely happy with the result and he still plays this instrument today. Even if you think all is lost, come in and see us. We may have some good news for you too.